Ceramic Filter Plate Knowledge -AdTech Metallurgical Materials Co.,Ltd. The relevant knowledge of ceramic filter plate is related to everyone. I believe that everyone knows about the ceramic filter plate. The ceramic filter plate is divided into: Ceramic filter plate Filter-PZr and ceramic filter plate Filter-PAL. Models, also known as ceramic filters, ceramic plates, ceramic plates, filter plates and so on. Ceramic filter plate technology and uses: ceramic filter plate using three-dimensional mesh structure and connected to the pores of the organic foam as a carrier, it invades the thixotropic alumina slurry, the use of four square correction center distance automatic extrusion technology, The slurry was evenly applied to the carrier’s foam body skeleton and baked and cured at a high temperature of 1180°C. Installed in the filter box for aluminum alloy liquid impurity filtration, to meet the production of high value-added, high-tech performance aviation, transportation and other aluminum alloy precision casting. Such as: computer hard drives, printing PS base, can making materials, jet turbine engine fan blades and other products. The basic structure of ceramic filter plate: Ceramic filter plate consists of plate base, positioning seat, outlet, and surface film. A ceramic filter plate is one of the core components of the ceramic filter. It is a new type of porous functional ceramic material, and its interior is covered with criss-crossing capillary pores (about 1 to 10 microns in diameter). This is the channel of the filtrate. This component is called the plate base layer. 2. The components of the ceramic filter plate are silicon carbide, corundum and other materials. The main components of the outlet and positioning base of the ceramic filter plate are composed of stainless steel or polymer material. 5. Improve surface quality, improve product performance, and improve microstructure. It can effectively remove large inclusions in the aluminum liquid and adsorb fine particles with micron size, which can improve surface quality, improve product performance, improve microstructure, and increase yield. Widely used in aluminum, aluminum foil, aluminum alloy and other production areas. Inspect and clean the filter box surface debris to keep the filter box clean and undamaged. Gently place the filter plate in the filter box and manually press the seal gasket around the filter plate to prevent the aluminum liquid from flowing or floating. Preheat the filter box and filter plate evenly so that it is close to the temperature of the aluminum liquid. The preheating temperature of the filter plate is not lower than 260°C. Preheating to remove adsorbed water helps to facilitate the opening of the initial filter pore size at the moment and prevents the heat from rising and shrinking to block some holes in the filter plate. Preheating can be electric or gas heating, normal heating 15-30 minutes. When casting, observe the change of the aluminum hydraulic head and maintain the normal demand for the flow control of the aluminum liquid. The normal initial pressure head is 100-150mm. When the liquid begins to pass, the pressure head will drop below 75-100mm, and then the pressure head will slowly increase. During the normal filtration process, avoid knocking and vibrating the filter plate. At the same time, the flow tank should be filled with aluminum water to avoid the perturbation of the aluminum liquid too large or too small. After the filtration is completed, remove the filter plate in time and clean the filter box. During the transportation and use of the ceramic filter plate, the filter plate must withstand a certain pressure impact from the outside, so the index is also introduced in the standard as a measure of the quality of the filter plate. The higher the compressive strength, the more durable the product, the better the quality, and vice versa. The standard defines the compressive strength as 0.5 MPa or more. Thermal shock resistance refers to the resistance of ceramic filter plates against damage caused by rapid temperature changes. 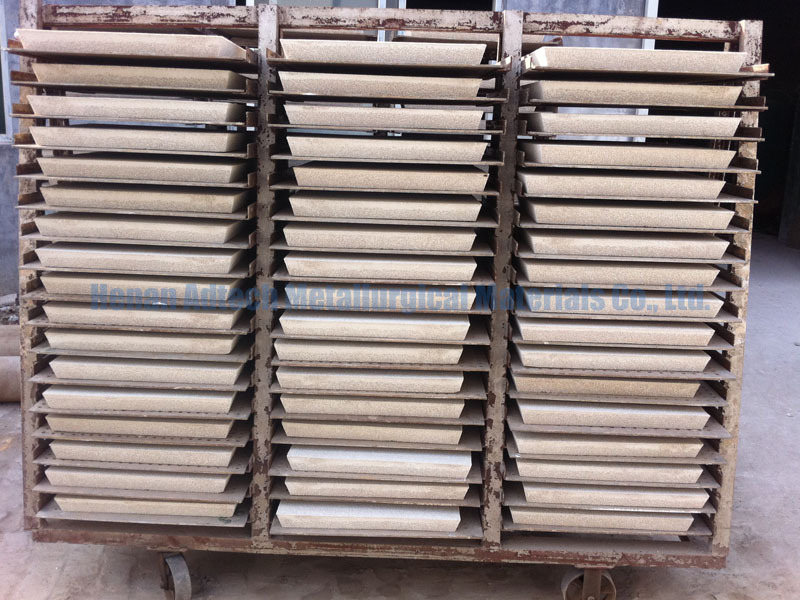 In the use of ceramic filter plates, we require users to gradually filter the filter plate to the temperature of the filtered aluminum melt before use, but begin to filter because some users do not observe this well. According to a provision, after the filter plate is set well, the melt is filtered without preheating, and thus the filter plate is required to have a certain resistance to thermal shock. The better the thermal shock resistance, the more durable the filter plate and the better the quality. The determination of the thermal shock resistance of the filter plate is based on the Industrial Standard of the People’s Republic of China “Test Method for Thermal Shock Resistance of Refractory Products” (YB4018-91) and the ferrous metallurgical industry standard of the People’s Republic of China “Testing the thermal shock resistance of refractory products. The method (air quenching method) (YB/T376.2-1995) was based on the characteristics of ceramic filter plates. The basic process of this test method is to preheat the furnace to 740±10°C (the filtration temperature of aluminum and aluminum alloy melt is generally 720±10°C) and keep it warm for 15 minutes. Then, the sample to be tested is quickly moved into the furnace. And keep it for 30 minutes. Then open the furnace door, quickly remove the sample from the furnace, let it exposed to the air to cool naturally, this process is repeated six times, observe whether the sample appearance defects such as fracture, damage and missing corners, if the sample appears these defects Any one of them shows that the product’s thermal shock resistance is not good, and vice versa.